Show-N-Shine is Open to ALL Vehicles! TitleShow-N-Shine is Open to ALL Vehicles! The coolest looking car at the O'Reilly Auto Parts Friday Night Drags and Shown-N-Shine is usually not found on the drag strip, but in the garage where hundreds of vehicles are on display as part of the huge Show-N-Shine competition. With seven different classes, vehicles from the turn of the century along with brand new current model year show stoppers can compete on equal footing. Vehicles are judged on five different categories - interior, exterior, engine bay, undercarriage and showmanship - to determine the champion in each class. The competition is fierce among participants searching for a first place trophy and bragging rights among friends. But the Snow-N-Shine is not all about amassing a gigantic hardware collection. "I love coming to Friday Night Drags and talking with other people that have the same passion for cars that I do," said Jay Woodson, owner of a 2016 Camaro SS out of Covington. It's a feeling also shared by long time participant Chris Gallagher of Fayetteville. "My favorite part about the Show-N-Shine is being able to talk about your car, explain how unique it is," said Gallagher. "I also like seeing other people's cars and reminiscing about them when we saw them growing up." Following judging, Show-N-Shine competitors can participate in the Speedway cruise and turn two laps on the world famous 1.54-mile high banked NASCAR oval track. "Getting to ride around the track and into the turns, you think you are going to slide down the banking, but you are not," said Woodson. "It's a pretty cool experience." While many of the vehicles are top caliber restored custom and classic show cars, many more are not. The Show-N-Shine competition - including the track cruise - is open to anyone and any make and model vehicle - from grandma's grocery getter to high performance sports cars and everything in between. Entry in the Show-N-Shine is just $20 per vehicle while additional passengers are $10 each. 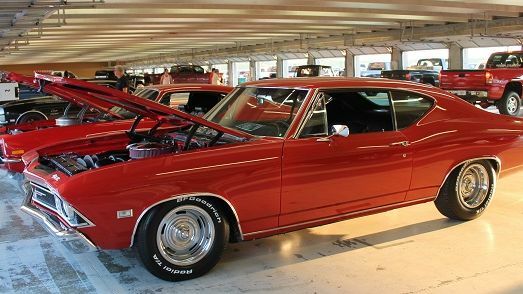 While 18 different divisions from factory street cars to tricked-out nitrous burning drag cars battle for supremacy on the pit lane drag strip, the title of best looking car of the night can be found in the Show-N-Shine competition. This Friday is also the points opener for Atlanta Motor Speedway's popular street-style drag racing series, O'Reilly Auto Parts Friday Night Drags. Competitors will have their first opportunity to collect all important points for the championship season in week three action of high-intensity, side-by-side competition on the famed pit-lane drag strip. Drag racing competition is open to all participants for an entry fee of $20. Vehicles are required to have a working seat belt, and each driver and passenger must wear a DOT-approved helmet. Drags will also include the weekly Show-N-Shine competition, with seven divisions of judging between cars, trucks and motorcycles. Show-N-Shine participation is $20 and also allows entrants to participate in the weekly Speedway Cruise on the 1.54-mile AMS racing surface following judging and prior to the start of drag racing eliminations. Vehicles from the Show-N-Shine will also be displayed on the front stretch following the Speedway Cruise. Pricing for combo tickets to compete in both the Show-N-Shine and drag racing are available for $30. Spectator admission is just $10, with children 5 and under admitted free. Exterior parking is free, and infield parking is $20. For more information about the 2018 Friday Night Drags season, contact the Atlanta Motor Speedway ticket office at (770) 946-4211, (877) 9-AMS-TIX or visit www.atlantamotorspeedway.com/drags.